Schematic shows laser light interacting with a plasmonic gap resonator, a miniature device designed at NIST to measure with unprecedented precision the nanoscale motions of nanoparticles. An incident laser beam (pink beam at left) strikes the resonator, which consists of two layers of gold separated by an air gap. The top gold layer is embedded in an array of tiny cantilevers (violet)—vibrating devices resembling a miniature diving board. When a cantilever moves, it changes the width of the air gap, which, in turn, changes the intensity of the laser light reflected from the resonator. The modulation of the light reveals the displacement of the tiny cantilever. NIST physicists Brian Roxworthy and Vladimir Aksyuk describe their work in the Dec. 6, 2016, Nature Communications. 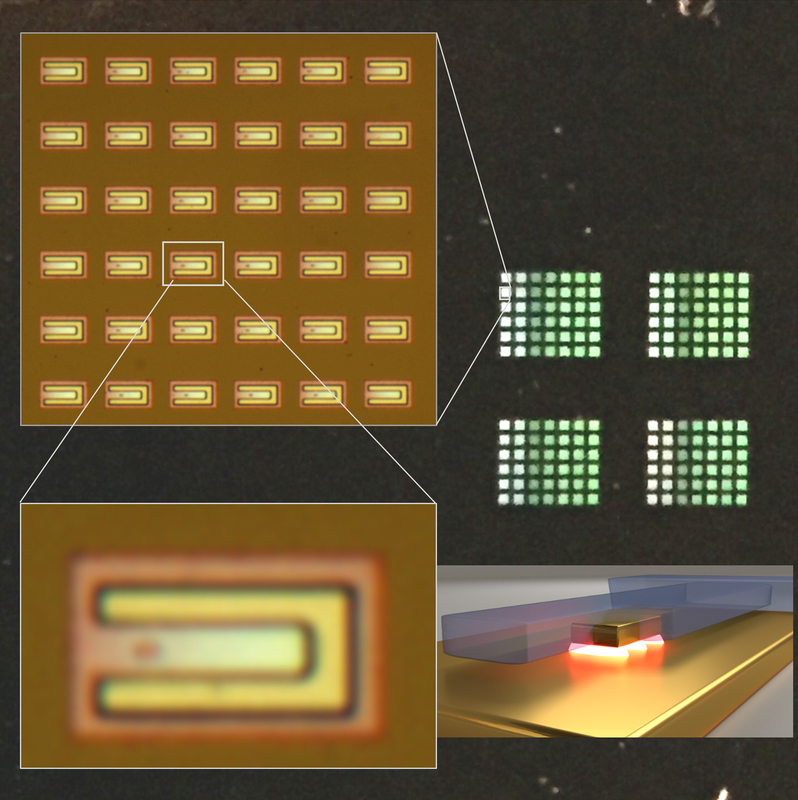 These optical micrographs provide a top-down view of several plasmonic gap resonators and zoom in on a single device. Bottom right shows schematic of a single device. The interaction between the laser light and the plasmons is critical for sensing tiny displacements from nanoscale particles, notes Aksyuk. Light can’t easily detect the location or motion of an object smaller than the wavelength of the laser, but converting the light to plasmons overcomes this limitation. Because the plasmons are confined to the tiny gap, they are more sensitive than light is for sensing the motion of small objects like the gold nanoparticle. The amount of laser light reflected back from the plasmon device reveals the width of the gap and the motion of the nanoparticle. Suppose, for example, that the gap changes—due to the motion of the nanoparticle—in such a way that the natural frequency, or resonance, of the plasmons more closely matches the frequency of the laser light. In that case, the plasmons are able to absorb more energy from the laser light, and less light is reflected. To use this motion-sensing technique in a practical device, Aksyuk and Roxworthy embedded the gold nanoparticle in a microscopic-scale mechanical structure—a vibrating cantilever, sort of a miniature diving board—that was a few micrometers long, made of silicon nitride. Even when they’re not set in motion, such devices never sit perfectly still, but vibrate at high frequency, jostled by the random motion of their molecules at room temperature. Even though the amplitude of the vibration was tiny—moving subatomic distances—it was easy to detect with the new plasmonic technique. Similar, though typically larger, mechanical structures are commonly used for both scientific measurements and practical sensors; for example, detecting motion and orientation in cars and smartphones. The NIST scientists hope their new way of measuring motion at the nanoscale will help to further miniaturize and improve performance of many such micromechanical systems. “This architecture paves the way for advances in nanomechanical sensing,” the researchers write. “We can detect tiny motion more locally and precisely with these plasmonic resonators than any other way of doing it,” said Aksyuk. The team’s fabrication approach allows production of some 25,000 of the devices on a computer chip, with each device tailored to detect motion according to the needs of the manufacturer. Roxworthy and Aksyuk, the two authors of the new paper, work in NIST’s Center for Nanoscale Science and Technology (CNST).